About this object The longest serving Speaker of the House, Sam Rayburn of Texas acquired a large collection of gavels. Speaker Rayburn is featured holding a few of his prize gavels in this 1954 image. On this date, Speaker of the House Joseph Cannon of Illinois broke a gavel while putting the House into the Committee of the Whole for further consideration of a bill. The Speaker banged the gavel hard enough to knock off the head, which landed between the clerks on the lower tier of the rostrum. Instances of gavels breaking during a session were not uncommon. Speaker Champ Clark of Missouri broke two gavels during the opening session of the 62nd Congress (1911–1913) while Speaker of the House John Nance Garner of Texas broke three gavels early in his Speakership. Tired of breaking gavels, Garner reportedly ordered an “unbreakable” gavel to be made of black walnut and treated with a special curing process. Speaker Thomas Brackett Reed of Maine was known as such an enthusiastic gavel wielder that he splintered the rostrum desktop. When the felt from his desktop was replaced late in the 51st Congress (1889–1891), visitors obtained the wood splinters as souvenirs. 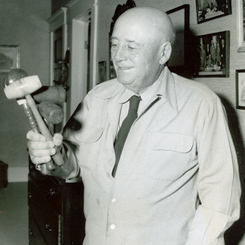 Speaker Sam Rayburn of Texas acquired an eclectic collection of gavels made from historic lumber. One gavel was reportedly made of timber dating to the burning of the White House in 1814. Of gavels Speaker Rayburn once said, “In the Speakership, the gavel becomes almost a part of the office.” He continued, “It’s habit. Any gavel you use has a lot of sentiment attached.” As in the past, most House gavels are still created in the House Carpentry Shop.